Adjusting to the news of a terminal illness can be extremely difficult - with just one sentence, everything is different. Coping with the changes that illness brings requires looking at all aspects of life in new ways, for the patient and also for friends and family members. Depending on the specific illness involved, the final weeks and months of life may leave patients unable to care for themselves and manage their everyday needs. 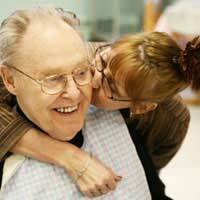 Adjustments in daily life can cause patients a great deal of stress, especially if they were once caretakers but must now rely on the assistance of others. This lack of independence is, for some, the most difficult aspect of dealing with an illness. Some patients prefer to hire caretakers rather than asking family members to help with everyday care-giving, while others hope to avoid bringing strangers into the equation. Those who wish to remain at home may need specialised home medical equipment, such as adjustable beds, lift chairs, bath safety products, and portable commodes. With forethought and planning, though, caregivers can help patients to remain as independent as possible. One of the most important things that loved ones can do for terminally ill patients is to ask for their input about all decisions regarding care, daily life, and even funeral arrangements. Many terminally ill patients feel powerless, with their fates being out of their control. While loved ones may not be able to change the outcome of the disease, they can offer reassurance that the patient's wishes will be honoured every step of the way. That knowledge alone can sometimes bring a sense of peace and acceptance. Even those who have not been particularly religious may seek spiritual counsel near the end of their lives. Knowing that time is limited can bring many questions of a religious nature to the forefront of the patient's mind as they contemplate their beliefs about death. Patients who already have strong ties to a specific church may feel comforted by visiting with members of the clergy, as may those have strayed from their religious upbringing, but still hold the same beliefs. If a patient is unable to attend services, family members can help by arranging for home or hospital visits by religious leaders. When time is limited, it feels more valuable. Terminally ill patients should be encouraged to enjoy their remaining time as much as possible, filling their days with their favourite activities, people, and foods. Often, it is the simplest of pleasures that are requested - a favourite dessert, time spent with family, or an evening of reminiscing may be the things that add quality to the patients' lives. Those who are closest may already know what types of activities would be best, but asking the patient is still wise. Sometimes, those who once enjoyed being surrounded by lots of people may now be more comfortable in small groups, and some may have a few lifelong dreams that they hope to fulfill. In any case, friends and family members should try to help patients make the most of their last days.